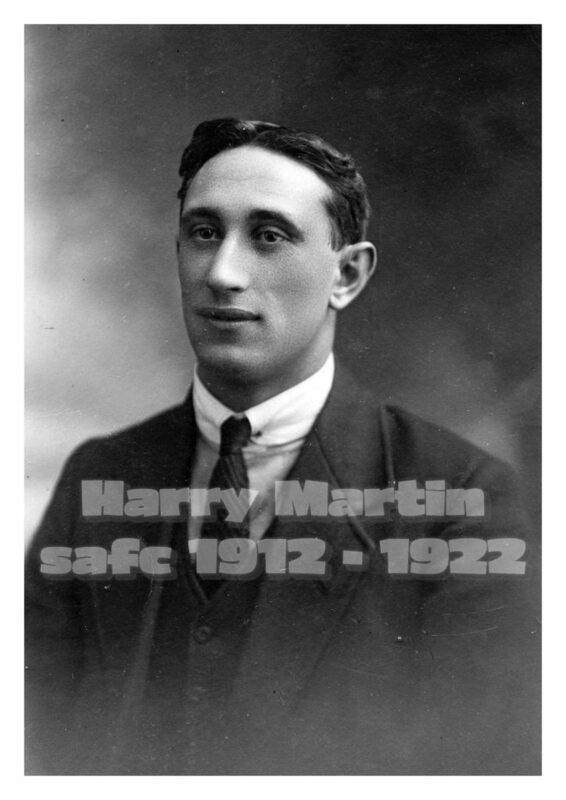 Harry Martin was born in Selston, Nottinghamshire on 5 December 1891 and started his footballing career with the local Sutton Junction club in 1909. He joined Sunderland in January 1912 making his debut in a 1 v 2 defeat at Anfield, where he scored after 15 minutes to give Sunderland the lead. A newspaper of the day commented that “a pleasing feature of the game was the display of Martin who was making his league debut after Bridgett was rested (on religious grounds). Martin gave a very creditable display though he should have scored more than 1 goal”. Martin was one of the fastest wingers of the day and signed on the same day as Walter Tinsley by then manager Bob Kyle his centres from the wing made many a goal with his “hanging centres” for the legendary Charlie Buchan. Martin was brought in as a replacement for another SAFC stalwart Arthur Bridgett who famously scored on The Black Cats demolition of Newcastle United in December 1908. Alongside Martin was George Holley who Ryehill Football has recently featured. Harry Martin was an ever present during the 1912/13 season, playing in all 38 games, plus the 9 FA Cup ties. In fact the only Sunderland change throughout the entire cup run was the enforced replacement of Milton, due to injury, by Ness. Therefore he was a mainstay of the side that won the 1912/13 league championship and was narrowly defeated by Aston Villa in the iconic FA Cup final of 1913 at The Crystal Palace in front of a then worlds record football crowd over over 120,000. Martin made his international debut in February 1914 alongside Sunderland team mate Frank Cuggy in a game that saw Ireland defeat their rivals for the first time on English soil. Martin also featured for the Football League against the Irish League in October 1913 together with Cuggy and Holley in Belfast. Further games against the Southern League in 1914 and the Scottish League in 1915 followed. Martin was drafted into the Army in 1914 and on the cessation of hostilities he once more turned out for Sunderland in 1919 where he continued to play into the 1920’s. It was in 1921 where he turned his hand to cricket and was part of a Charlie Buchan Footballers Side that took on a local team at Hendon Cricket Club in the Dennis Hendren benefit game. Some forceful driving with the bat saw Martin score 43 to help Buchan’s side amass 330 to ultimately win the game by 122 runs. All told Martin made 230 appearances for Sunderland, scoring 22 goals. Martin was transferred to Nottingham Forest on 22 May 1922, with whom he had guested briefly for and when his army duties permitted in WW1, during the 1915/16 season. At Forest he played well over 100 times in his 3 seasons with them before moving onto, and finishing his footballing career with Rochdale, then in the Third Division North. His career at Forest had ended sadly with relegation. His Spotland sojourn ended with The Dale applying for re-election. Martin then held a succession of managerial and Trainer positions with York City, Mansfield Town, Newport County and Swindon Town. His spell with The Stags which commenced in January 1934 was particularly successful as he guided Mansfield to a top half finish in the Third Division North for the first time. He was into his 60’s by the time he finished his professional football career as a member of Swindon Town’s backroom staff. Harry returned to Sunderland for a week’s holiday with his wife Elsie in June 1954, the first time he had visited the then town since 1925. Then 62 Martin was interviewed by the Sunderland Echo and he was quoted as saying; “we both thought that it was time to come back to Sunderland to visit the many friends we made” explained Harry, “anyway I was dying to see the Roker ground again”. At the time of his visit he had been trainer of Swindon Town for 18 years. It was the last time he would visit Sunderland and Roker Park. Harry Martin died on New Years Eve 1974, aged 83, in his home County of Nottinghamshire. Good enough to keep Bridgett out of the Sunderland side that alone was testament to his ability. As a stalwart of the 1912/13 Sunderland side that almost won the double he remains an important player in the history of Sunderland AFC.